It was great to see so many Velos together on Wednesday evening – thanks for rolling up for a stationary chat, bite to eat and a bit of discussion about the group and where we go from here. Two years ago, 3 chaps sat in the Rose & Crown saying “it would be great if we had a few people to cycle with who fancy a chat & a pint too”. Now, those 3 guys have over 90 friends they email every week and cycle with people travelling from as far afield as Cornwall, Belgium & Holland to join them in our stunning Chilterns countryside. Some have cycled for years and some have just been out and bought their first bike. It has become a local cycling group with a strong social side; a friendly bunch who just want to jump on a bike and have some fun whilst clocking up some – in some instances, significant – miles. Andy reported that he is discussing with British Cycling about us being a social cycling group and is waiting to hear about us getting accreditation from them – watch this space. The technical department suggested that our Facebook page might be a good medium for those “anyone around for a ride today/tomorrow” type conversations. As it isn’t a vehicle used by everyone, the suggestion of a forum on the website was mooted. Several of the midweek rides are currently organised on Twitter or by SMS – which is working well for those in those loops – if you’re not and you would like to be, drop us an email and we can point you in the right direction. We will be putting a short survey together to gather everyone’s input and take a best guess at which options are going to work for the majority. As ever, the need for speed came under discussion. A large number of clubs (please note we are a group of cyclists not a club, so that sets us apart to start with!) issue guidelines on what speed they expect rides to be ridden at. We have gathered a number of people to our numbers by our “as fast as the slowest rider” approach – for which we were wholly commended. That ain’t gonna change! The Tea Ride will continue in it’s group style, waiting at the top of every hill and at frequent, safe points along the ride to re-group and refresh, with the obligatory Tea ‘n’ Cake stop, before returning to HQ. On Sundays, the more fleet of pedal will depart at 10am as currently happens. Those looking for something a little more tranquil will leave close on their tails but will also have an experienced rider with them, who knows the route, will keep the group together but will also be on hand to assist with any little nuisances such as the occasional puncture. This should make the Sunday ride more accessible for everyone. The following people volunteered to lead the leisurely group on a rota basis (if you’ve been missed off or would like to step up, please let us know):- Dodd, John Hegs, Dan R, Jim, Iona, Martin, Mary, Pete, Gary, Andy B, Ian (as in ‘& Jacky’), Angela. They will receive an email reminding them it’s their turn on the forthcoming weekend and will ensure someone can cover for them if they are unable to ride. 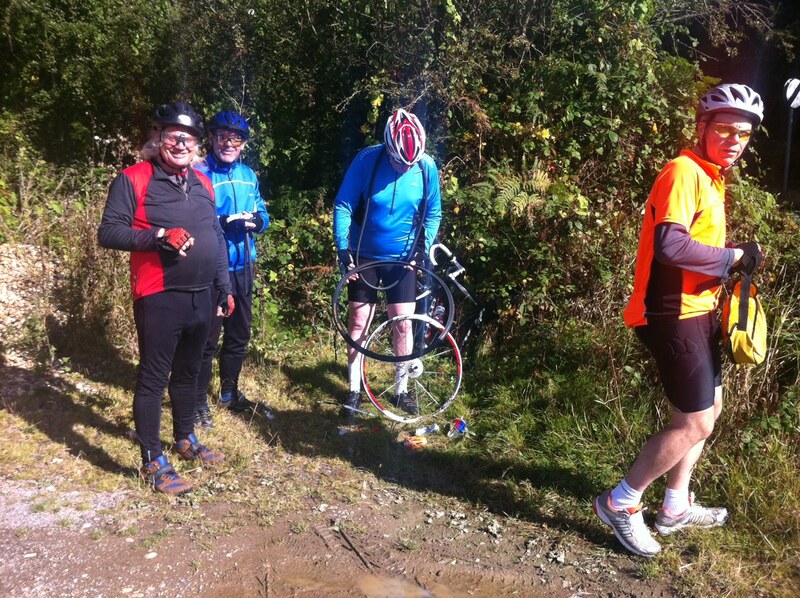 There are various midweek rides – off road & The Soup Ride, for example. It is proposed that there are additional, mid-week web postings & emails detailing the plans for these (or how to contact whoever is organising them). Following the success of the recent Historic Churches ride, the Normandy Invasion & the “Back from Northampton” ride, it was mooted that more of these longer/all day leisure rides should be organised. Anyone who has any suggestions or ideas of routes – please feel step forward with your thoughts or half-thoughts (there’s plenty of opinions in the group who can help develop an idea), suggest a date or place and together we can have some great days out. In that vein, again come the request for more input on routes for each week. We use Mapometer.co.uk to plot them out currently. If you have some ideas, plot it out and email it in – or just send us a message with some directions & village names on it and we can add it to our list of published routes. Over a last beer or two, we rounded up with some great comments from the group about how the informality, lack of competition (aside from the odd Strava moment or two!) & “the more the merrier” attitude has been so appealing, welcoming and encouraging. Especially to those who were also “just looking for a few people to cycle with”. Well done everyone – you are what makes the group what it is! And as for tomorrow’s ride ….. it’s here! Thank you so much for posting the photo of the team helping me with my puncture. Thank you too, all on the ride for waiting while “we” fixed it. Shame we’re not Team McLaren who can change 4 tyres on a F1 car in 2.8 seconds! !